Two key elements firmly established Chicago’s rise to prominence beginning in the mid 1800s. First, the Chicago Portage connected the vast Mississippi River valley with the Great Lakes eastern trade. This system was enhanced by the 1848 opening of the Illinois and Michigan Canal. Second, an important new technology emerged in the 1830s that’s still associated with Chicago today. That phenomenon, of course, is the railroad. And although much has been written about Chicago’s first railroad – the Galena and Chicago Union (G&CU) – less has been documented about its early years, from 1836 to 1850. Although the railroad never lived up to its name, never making it to Galena, it set into motion many economic benefits enjoyed by Chicago and northern Illinois. And, it truthfully can be said that the farmers living in Winnebago, Boone, Stephenson and Ogle counties in Illinois, as well as in southern Wisconsin, played an important role in bringing the city’s first railroad to life. A railroad has to go someplace, and the organizers of the G&CU had their eyes on the abundant lead mining district of northwest Illinois. This corner of Illinois was governed by Galena, formerly called the Fever River settlement, where a post office had been established in 1826. The first wagonload of lead from Galena to Chicago is believed to have arrived at the Chicago River in the summer of 1829. It took about 11 days to travel from Galena to Chicago in Conestoga-style wagons loaded with pigs – or ingots – of lead. A railroad was clearly needed. Prominent Chicago citizens were keenly aware of the stiff competition that St. Louis posed for lead shipments traveling via steamboat from Galena down the Mississippi River. In addition, Milwaukee was vying to receive the same mineral riches. Early railroad organizers recognized the need not only for freight traffic but also passenger service between Chicago and Galena. They wanted the railroad to compete with the Frink and Walker stage coach line that connected Chicago with Galena in 1834. The first mention of a railroad westward out of Chicago appeared in the Dec. 3, 1834, edition of the Chicago Democrat newspaper. The original charter was prepared by Ebenezer Peck and Judge Teophilus W. Smith, both of Chicago. On Jan. 16, 1836, “An act to incorporate the Galena and Chicago Union R.R.” was chartered by Illinois lawmakers in Vandalia, then the Illinois capitol. But attempts to raise money from East Coast investors were unsuccessful, and the federal government denied a request for land that the railroad would need. By contrast, land grants were approved for the building of the Illinois/Michigan Canal and the Central Railroad, later known as the Illinois Central R.R. G&CU Chief Engineer James Seymour conducted the first survey for the railroad in the fall of 1836 and submitted it the following April to his eagerly waiting employers. Seymour recommended that a portion of the line be built eastward, from the Des Plaines River toward Lake Michigan, so that a sawmill there could provide timber. This 1865 G&CU map shows how the rail line between Chicago and Galena eventually developed, although the last leg, between Freeport and Galena, was built by Illinois Central, not G&CU. The failure of the G&CU line is the result of several factors, including a decline in lead mining in Galena and the acceleration of the California Gold Rush. Elijah Kent Hubbard, then just 24, became the second president of the G&CU in November 1837. He was a cousin of Gurdon Saltonstall Hubbard, one of the most influential citizens of early Chicago. But railroad construction was set back by the Financial Panic of 1837 and the state’s overspending on grandiose internal improvement projects. In the fall of 1838, Elijah Kent Hubbard supervised the driving of piles and laying of stringers along Madison Street – but died an untimely death the following May. The majority of stock passed into his estate and languished there for eight years, until a new group of promoters purchased it in 1846. Construction finally resumed in the spring of 1848. The resumption of the Galena railroad under its original charter can be linked to the Rockford Railroad Convention of 1846. On Nov. 28, 1845, Rockford citizens called for a meeting about the stalled railroad. It convened on Jan. 7, 1846, with representation from 10 counties in northern Illinois (and one in Wisconsin – which didn’t achieve statehood until 1848, three decades after Illinois.) Of the 319 delegates, a majority were from Winnebago, Stephenson, Boone and Ogle counties. Improved transportation was of major concern to local farmers, who were experiencing agricultural surpluses during the 1840s. The urgency was most keenly felt by the counties bordering the Rock River – agitation for a railroad extending from Chicago to Rockford had begun in 1941. At first, little came from the meeting; capital was in short supply because of economic difficulties. But while subscriptions were being solicited along the line of the proposed enterprise, interested citizens of Chicago succeeded in purchasing the charter, improvements and land of the G&CU R.R. Also in 1846, Richard Morgan was employed to make an engineering survey of the route between Chicago and Rockford. It was suggested that Galena citizens undertake the portion between Galena and the Rock River. Morgan’s report concluded that rail traffic eastward would be three times greater than traffic westward. Along the right of way outside of Chicago were towns with names like Harlem (present-day Maywood), Babcock’s Grove (Lombard), Danby (Glen Ellyn), Wheaton, Winfield and Junction (West Chicago). A boat called The Buffalo left Michigan City, Ind., and reached Chicago on Oct. 10, 1848. The cargo on the schooner was Chicago’s first locomotive – The Pioneer. 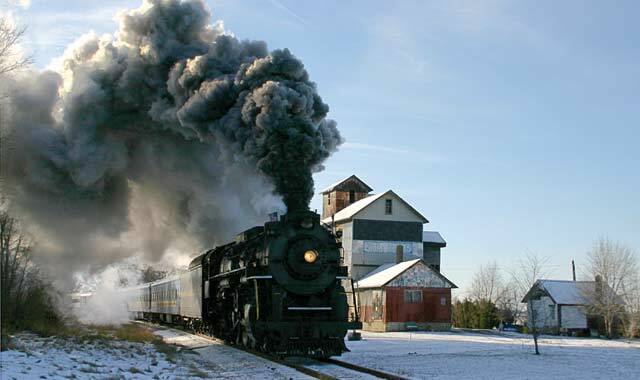 The little wood-burning engine was purchased secondhand and hauled by animal teams to the tracks. The Pioneer made its first movement out of Chicago in late October 1848. The early rolling stock of the line was built by Scoville’s Chicago Car and Locomotive Works. Rockford greeted its first train on Aug. 2, 1852. The city’s first depot was located at Kishwaukee Street and 4th Avenue. The G&CU became a part of the Chicago North Western system in 1864. The final division to Galena was never built by G&CU, and trains later ran from Freeport to Galena over Illinois Central tracks. A number of factors contributed to the line’s failure to reach its namesake. First, lead mining in the Galena area was declining and the California Gold Rush was accelerating. Second, Galena businessmen wrongly gambled that steamboats would outlast railroads, although the silting up of the Galena River didn’t help the steamboat’s future any. But the main reason that Chicago lost interest in Jo Daviess County was the advent of the United States Transcontinental Railroad in 1869, which reduced coast-to-coast travel time from six months to one week. While the Transcontinental Railroad was in planning stages, the G&CU instead built the more direct Dixon Air Line to the south, connecting Chicago with Fulton, Ill., and extending across Iowa to Omaha, Neb. In 1862, the G&CU had leased in perpetuity the Cedar Rapids and Missouri Railroad, which was to be the first railroad to reach Council Bluffs, Iowa, and the First Transcontinental Railroad. The G&CU consolidated with the Chicago and North Western Railway in 1864 and merged with the Union Pacific Railroad more than a century later, in 1996. Spearheaded by Chicago businessmen like Walter Newberry, William Butler Ogden and Charles Walter, the company formed the core of that future corporate giant, the Chicago & North Western Railway System. Today, the G&CU’s main line between Chicago and West Chicago is a busy commuter service, jointly operated by Union Pacific and Metra as the Union Pacific/West Line. 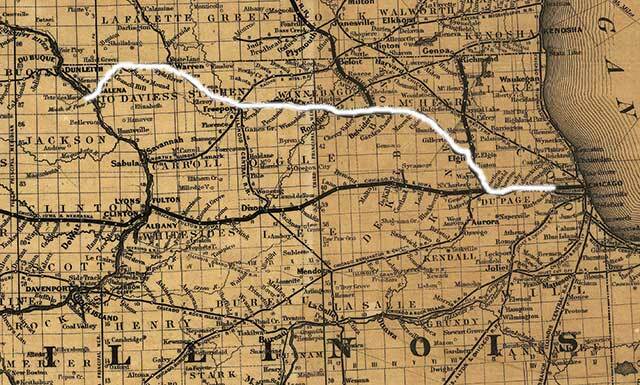 Northern Illinois can assuredly point out that Chicago’s first railroad was built by Chicago leaders, with money raised inside Illinois, much of it from northern Illinois and southern Wisconsin farmers. Although government assistance was petitioned and subsequently denied, the line was constructed without wealthy railroad magnates from the East. Remarkably, the line was built westward without an eastern railroad link. The successful collaboration between the yeoman farmers and the Chicago plutocrats of antebellum Illinois made Chicago’s rail debut possible. Editor’s Note: Jeffrey J. Meyer is a Dubuque, Iowa, historian and author who may be contacted at jjthedrafter@yahoo.com. Sources for this piece include: The Early History of the Galena and Chicago Union R.R. Master’s thesis by Ralph William Marshall, University of Chicago, 1937; Trails to Rails, a Story of Transportation Progress in Illinois by Carlton J. Corliss, 1934; Bulletin No. 27 of The Railway and Locomotive Historical Society, Harvard Business School, Boston, March 1932; Galena, Grant and the Fortunes of War, by Kenneth Owens, Northern Illinois University, 1963; and The Galena and Chicago Union R.R., A Symbol of Chicago’s Economic Maturity, by Patrick E. McLear, Illinois Historical State Society, 1980. This entry was posted on Monday, December 10th, 2012 at 11:56 am	and is filed under Features, Top Posts. You can follow any responses to this entry through the RSS 2.0 feed. Both comments and pings are currently closed.